Since 2002 CICCIC has been supporting arts and culture and creative industry businesses and start-ups. From workshops to conferences. To training and sector discourse events. We have helped many to start and grow their practice and business. To date our directors have supported over 80 businesses and help start 7 new community interest companies, created leaders who have developed businesses, cultural events and community organisations. 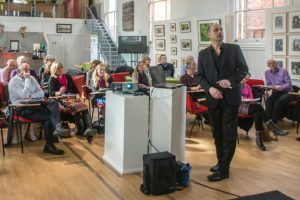 In 2015 it was decided to house all our business services away from our arts centre and gallery to Somerset Arts Business Cultural Alliance, as the impact of our work was more county wide. Since then we have run multitude business support events and expanded our arts and culture business network.